In 1968, Banks co-founded the American Indian Movement (AIM) and established it to protect traditional ways of Indian people and to engage in legal cases protecting treaty rights of Natives, such as hunting and fishing, trapping, and wild rice farming. He participated in the 1969–1971 occupation of Alcatraz Island in 1972, he assisted in the organization of AIM's "Trail of Broken Treaties", a caravan across the U.S. To Washington, D.C., to call attention to the plight of Native Americans. The caravan members anticipated meeting with congressional leaders about related issues; however, government officials refused to meet with delegates of this group which resulted in the seizure and occupation of the Bureau of Indian Affairs office. He also spearheaded the movement on Pine Ridge Indian Reservation in South Dakota in 1973 to oust the corrupt government-appointed chairman. These activities led to the occupation of Wounded Knee and a siege of 71 days, which received national attention. 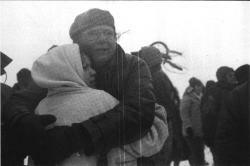 Banks was the principal negotiator and leader of the Wounded Knee forces. As a result of his involvement in Wounded Knee and Custer, Banks and 300 others were arrested and faced trial. He was acquitted of the Wounded Knee charges. Refusing the prison term, Banks went underground and organized a small armed AIM group. He received amnesty in California by the Governor Jerry Brown, who refused to extradite him to South Dakota. He also received financial support from actor and AIM sympathizer Marlon Brando. 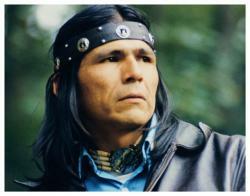 He wrote, with Richard Erdoes in 2004, Ojibwa Warrior: Dennis Banks and the Rise of the American Indian Movement.